Curated by Bay Area-based Joseph del Pesco, On Being an Exhibition presents a collection of works including oil paintings made in China. Upon entering the space, visitors exit the elevator and enter the gallery only to find themselves trapped inside a space that architecturally simulates the look and feel of the same elevator they just left. In a curious detail, push buttons constructed from wooden dowels and childishly handcrafted arrows act as an interface for visitors between the simulated and real elevator. Doubting whether this low-tech button will actually summon up the elevator and safely bring its passengers down, one is made aware of the aesthetics of functionalism common to quotidian devices. Created by the Quebec-based collective BGL, Elevator (2007) leaves some befuddled and waiting with uncertainty in the “dummy space” We are reminded of the pleasure of the trompe l’oeil: being fooled by the artist who kicks you in the rear with clever, perceptual tricks. Similar in strategy, Conrad Bakker deploys his signature use of paper-pulp sculpture and oil paint to simulate a projector propped up on a stack of books and magazines (the current issue of Artforum, the catalogue of the exhibition itself, etc.). Placed on the wall are Day-Glo green letters forming the word “Epson” mimicking a projector when it is first turned on. As a sculptural simulation of the moment preceeding the technological event, Bakker’s work presents the overlooked as a way to describe a specific slice of material history. Vancouver-based Germaine Koh’s Fair-weather forces: (sun:light) (2005) is an installation that senses the amount of natural light outside the gallery space and calibrates the interior lighting to match the sunlight’s intensity. During the daytime, visitors can witness subtle variations in lighting; at night, they find themselves in partial darkness–an inverse logic that obviates the very purpose of artificial lighting. In directing the viewer’s attention towards light and space, Fair-weather forces recalls James Turrell’s Meeting (1986) at New York’s PSI, in which visitors enter a square room with no ceiling one hour before dusk. Facing each other, waiting in silence, visitors experience the sublime as the penultimate moment before darkness. By contrast, viewers of Fair-weather forces find themselves either staring dumbly at the light fixtures, at the electrical switch box, or out the windows, wondering if the installation is “working” Koh’s piece, then, offers us an experience of the wry sublime–a two-for-one or double-your-money experience in which viewers not only get to experience the sublime but also get to laugh at themselves while doing so. Laurel Woodcock’s (Untitled) Neon Quote (2005) is a set of neon lights shaped in the form of quotation marks. Placed above the front attendant’s desk in the gallery and reflected in windows throughout the gallery, the neon quotation marks comment self-reflexively on the use of utilitarian media as a trope of late-20th-century conceptual art and the historical convention of the white-box gallery. In a critique of irony, the Italian philosopher Giorgio Agamben warns of art that “is only a negation that negates itself, a self-annihilating nothing” He goes on to describe this kind of art as a “god that destroys itself” and a “god that destroys the very principle of negation.” While I agree with Agamben’s critique of nihilism and the urgency of committed art, I am also enchanted with the idea that artwork such as (Untitled) Neon Quote functions as an irresolvable puzzle that perpetuates its own self-torture maniacally. In contrast to Woodcock’s literalist style is Mama (2006), a sculpture by the Turin-based art collaborative Isola & Norzi (Hilario Isola and Matteo Norzi) that also reflects on the metaphysical nature of exhibitions. 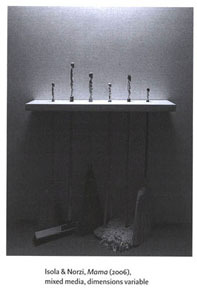 A white minimalist shelf cantilevering from the wall casts a shadow over a set of commonplace brooms and mops, drawing associations with the shadowed economy and humility of janitorial work and housekeeping. Rising above the shelf and brightly lit, the handles are whittled into pregnant female figures that resemble traditional African totems. In conflating symbols of domestic labour with traditional African iconography, Mama questions the role of colonial museological institutions in portraying and containing the Other, an acquisition that reveals the alienation of the captor. The exhibition catalogue takes an experimental format that delegates authorship to a wide range of accomplices as a way to dismantle notions of the self-sufficient artist-genius. In place of a description of the works, the catalogue consists of 250-word excerpts from people the artists involved in the exhibition have cited as influential to their practice, including Bruce Lee, John Dewey, Woody Allen, William S. Burroughs, the Pet Shop Boys, Harry Houdini, Karl Marx and the Bay Area artist Scott Oliver. Read as a set of aphorisms that raise questions rather than explicate, the catalogue presents the non-expert as art commentator and curator as re-distributor, an epistemological shift emblematic of del Pesco’s curatorial practice which strives towards openness, inclusion and play.